As the current monarch of the United Kingdom, Canada, Australia and a bunch of other countries that have her on their money, the Queen enjoys something known as sovereign immunity. In a nutshell, sovereign, or crown immunity as it is sometimes known, means that the Queen is for all intents and purposes above the law. So does this mean that the Queen could just up and kill somebody if she felt like it, all the while getting off scot free? In theory, yes, absolutely. It turns out the queen can commit any crime just about anywhere in the world and get away with it legally thanks to the fact that she enjoys both sovereign immunity and diplomatic immunity. As we’ve discussed in our article on whether diplomats can really get away with murder, diplomatic immunity is so exceptionally far reaching in its scope that a person protected by it could indeed go all Lethal Weapon 2 on everyone with total impunity. You see, part of her immunity stems from the fact that all justice in the United Kingdom and various other countries she rules is meted out in her name. Now, obviously the Queen doesn’t personally dispense justice like the Kings and Queens of yore, among other reasons because doing so would be impractical. As a result of this, whilst the Queen is considered the “fount of justice” for her subjects, the ability to administer it is doled out to judges across Britain- all of whom are granted the post-nominal of QC (standing for Queen’s Counsel) as a nod to their position as an extension of the Queen’s will. Likewise, the Crown Court similarly dispenses justice in the Queen’s name and as a result, all cases brought before it are tried as The Crown Versus *Blank*. Unsurprisingly from this, it is not technically possible for the Queen herself to be tried before the Crown Court as it would involve her prosecuting, well, herself. 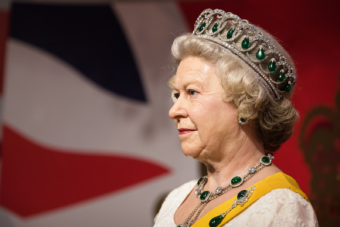 Looking more deeply, her sovereign immunity also makes it so that the Queen cannot be tried in civil proceedings either, meaning she cannot be sued or have other such civil proceedings brought against her. The Queen also cannot be forced to testify in open court or even be interviewed by the police, not that this matters seeing as she also can’t be arrested. And even if she could be legally arrested for a crime, it wouldn’t matter anyway. You see, technically no arrest can be made “in the monarch’s presence” without her consent. Thus, arresting her is impossible on this count too because it would most definitely have to happen in her presence. In addition, as if it being impossible to arrest someone just standing near the Queen, let alone the Queen herself, this protection extends to her various palaces too, meaning the police can’t arrest anyone, including the Queen, in any place she currently inhabits unless she gives assent. It’s perhaps also worth mentioning that all prisoners in the United Kingdom are held “at her Majesty’s leisure” (which is why the Queen can pardon criminals if she so wills it), meaning she could just walk out of prison anyway by telling everyone to let her go. Now you might say if she did all this, surely Parliament would step in and curtail the murderous Queen’s powers to ensure she could be prosecuted. Another avenue that could be pursued in regards to prosecuting the Queen would be to force her to abdicate, removing the many protections she enjoys. To be clear though, this wouldn’t necessarily open the Queen up to prosecution as, under British law, nothing she does as Queen can be considered illegal- it’d just mean she could be prosecuted for any further crimes she happened to commit after. It’s also worth noting here that the Queen has the power to completely dissolve Parliament if she so chooses and cause a whole new set of people to be elected. And if this group displeased her, she is free to do it again and again. It’s also the Queen’s duty to appoint the prime minister and she could, in theory, appoint anyone she wanted to the position, regardless of the way the British public voted in any elections. So installing someone who would do what she wanted would not be any real hurdle. Yes, like with the police, every member of the Armed Forces in Britain swears an oath of fealty to the Queen and she is considered the ultimate authority in regards to military matters. Thus, if there was an attempt at a Parliamentary revolution and members of Parliament refused to step down as they were rewriting British law without the Queen’s consent, she could simply order the British Armed Forces to forcibly remove them from power or even line them all up and have them executed. The question then would be, in such a scenario, would they honor their oaths to the Queen? Speaking of her power over the various groups of highly trained armed forces, the Queen has a remarkable number of ways she could theoretically kill someone if she felt so inclined, without need to get her own hands bloody. For example, she could instruct a crack team of SAS commandos to silently make a person disappear, tell her personal guard to charge them with their bayonets, or ask the Red Arrows to crash into someone’s house. Again, whether the soldier, sailor or airmen in question would honor their oaths and listen to the order is another matter entirely- but the point is, if the Queen ever gave such an order there is no authority on Earth that could legally override it save for herself. If the Queen felt particularly gung-ho she could even personally declare war on any nation or person and, thanks to her Royal Prerogative, need not consult anyone about it before hand. In fact, she could even authorise a nuclear strike on a person anywhere in the world via Britain’s secretive and expansive network of nuclear submarines, again thanks to the fact that all of the men and women stationed aboard these vessels swear to put the Queen’s orders before all others. Now you might say a foreign power might get pretty upset if that nuclear strike happened on their soil, and the International Criminal Courts might also try to step in, but if they decided to tangle with this rather formidable woman, the Queen could theoretically make her army larger by commandeering any ships that entered British waters (another power of hers) and by commanding the various armies of the commonwealth (all of whom swear a similar oath of fealty to the crown, same as the British armed forces) to come to her aid- that’s a lot of nations and military might. Again, how many of these armies would listen, particularly after she decided to go all Armageddon on the world, is irrelevant to the legal discussion at hand- what matters is that the Queen technically has the ability to do all this and that nobody could legally stop her. Can The Queen Be Arrested? Is The Queen Really Above The Law? Could the Queen ever go to jail? Whose hand is on the button? Of course, there is a reason for the Queen being the titular head of the military and the justice system. The English would never have agreed to follow a king – or anyone else, for that matter – if he hadn’t promised to protect them from their enemies, both external and internal. In fact, that was the whole function of early government. You can see that in the Bible. Once Moses led the Israelites out of Egypt, he found they were bringing their disputes, both civil and criminal, to him, and he was forced to appoint judges. Once in Canaan, everyone “did what was right in his own eyes”, until an external enemy arose, in which case some charismatic leader was drive off the foe, after which he was expected to settle their disputes – hence their title of “Judges”. Faced with a more formidable enemy, the Philistines, they asked to be given a king. And when you read the history of Kings David and Solomon, you discover that they were sitting in judgement when they weren’t leading in battle. I might add that if you are prosecuted in the U.S., the case is listed as “The People vs [Blank]”. It makes it sound like it is downright undemocratic to acquit you. I’m not sure if i followed Nigel’s train of thought entirely but Mr Malcolm Smith’s argument is really more like wishful thinking. I wish it were so. But All this is WRONG. Charles I believed exactly what this article says and he was tried and executed anyway by Parliament. Whoever wrote this article is ignorant of history. I am not British BTW. This is a legal approach, there’s nothing wrong with it. Charles I was only executed after a bloody civil war in which the Parliament amassed a huge army by itself. Parliament also had the advantage of beeing far more capable of financing the campaign than Charles I. After his defeat, the monarchy was effectively replaced by a republic. So in the end of the day, it was a successful revolution. Revolutions care not about legal matters. All operations in regards to the law of the land, as understood by the monarchy, resumed their normal course with the restoration. Hmm, somebody didn’t read the article. Thank you for this clear answer. It makes a lot of sense and it is nice to see that even the reach of Her Majesty is clarified. If the queen would make use of all the above mentioned powers at her disposition, we would truly be in for some interesting times. I would however like to know if somebody here knows the reach of the international court? I assume that most countries have created similar powers (or legal standing) for their reigning *insert your preferred title*. Yet the international court has prosecuted persons who where, by their own national laws, considered beyond the legal reach of their law system. “After world war *pick a number higher than two* which was lost by the commonwealth, the then current British monarch could be legally be prosecuted for crimes against humanity by the international court. And also be prosecuted for the crime (which presumably started this war) of killing (or ordered the death of ) an other state’s official? If the monarch is so immune, why was Edward VIII, the Queen’s uncle, forced to abdicate? Not only for his marriage to Wallace Simpson, but more importantly for his coziness with the Nazis and his other faults. I understand these articles are for entertainment purposes and such historical discussion may be beyond their scope. Still, the Queen realistically must represent all that is best about the British people, or bad things will come her way. She’s not my queen, but I really respect her. We will never understand how heavy the crown must be for her to bear. I usually enjoy these articles, but this one is too silly and flippant for my taste.